This month, we’ve been telling stories of transformations. As a new year begins, you may be looking for inspiration to make a change in your life. This might mean a change of your outlook, a change in career, or a change in your body. People across the world set out to make these adjustments to their routines, and find out it’s not as easy as a ‘before and after’ photo may make it seem. ElliptiGO rider Brooke Hargreaves is an outstanding example of persevering through the process and accepting the easy with the hard. Over the last few years, she has lost over 45 pounds and over 30 inches in her measurements. Read our interview with Brooke below and you’ll see why we’ve named her the January 2019 Rider Of The Month. Brooke, tell us a little bit about how this journey all began. I broke my left knee in 2007 and dislocated my right knee, so over the next eight years I slowly gained about 30 kg [66 pounds]. I was in a career that was super stressful, and working ridiculous hours. How did you decide to begin your weight loss journey? What was your AHA moment? Did you have any obstacles or issues during your journey that your ElliptiGO bike solved? Due to the huge weight gain, I had issues with my knees and also with my back. I had a lot of lower back pain which affected my sleep and daily life. Plus, my confidence! How did ElliptiGO bikes become a part of your plan to reach your goals? I own the original 8S. His name is ‘Spencer’ and he just turned five years old! 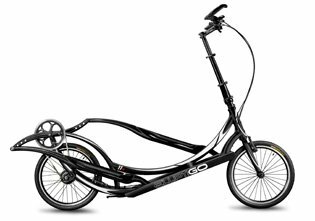 I had been looking at an ElliptiGO bike for two years before I was able to borrow one that was stored in a warehouse three hours away. After that test ride, it took another year before I took the plunge to buy one. I bought “Spencer” in July 2013 because I needed something that was low impact. Now, my bike forms part of my strength and endurance training for Dragon Boating. It provides high-intensity training and keeps my heart rate up to where it needs to be. I can train my lungs to be able to breathe better in the boat during races. As it is low impact, it doesn’t put the kind of stress on my body as running or climbing the Mount does, so that I can still pick up a paddle and give it my all. What other benefits have you seen in your life beyond the number on the scale? Better sleep, better skin, plenty more adventures with friends as we go riding and they always invite “Spencer” along! What role has the ElliptiGO community played in your life, your fitness, your riding experience? I have become friends with so many in the community — it’s incredible! Here in little New Zealand, I don’t have any other riders to spend time with, but I have been so lucky. When I was in New York in 2016, fellow ElliptiGO riders Carol, who came up with her fleet, and Renae, who came over from Texas, rode around Central Park with me. Thomas has been planting the seed for the 5-Boros ride, and one of these days I’ll get there! Being part of the Global ElliptiGO Riders Club keeps you motivated to put in some effort and rides. You develops friendships, and a little bit of friendly rivalry keeps everyone accountable. Take the plunge. Invest in an ElliptiGO bike. You won’t regret it!